This is the story of a small country, a country which was not yet developed and which was not connected to other countries. There was a king who rules on the country. All peoples in the country were living happily. It was a backward community of peoples. But one day they were found by the countries near them. There was nothing in tinny country to get for other countries accept one thing, the population. Whenever someone grew in tinny country, they took that one to work for them in their country. Also they used the country as a toy to train their soldiers. They attacked on the country whenever they wanted to. 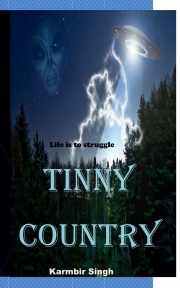 Did tinny country overcome that crush? If yes then how? Read more to know. Karmbir Singh is a 1991-born, funny guy. Privet job worker turned happy author. This is another book toward the success. He is a dream- lover boy. To write a story, was the one from his lot of dreams. He always likes to tell his own fiction stories to children in his childhood. And now he turns to tell the stories to the world! Karmbir Singh lives in Delhi NCR with his parents.